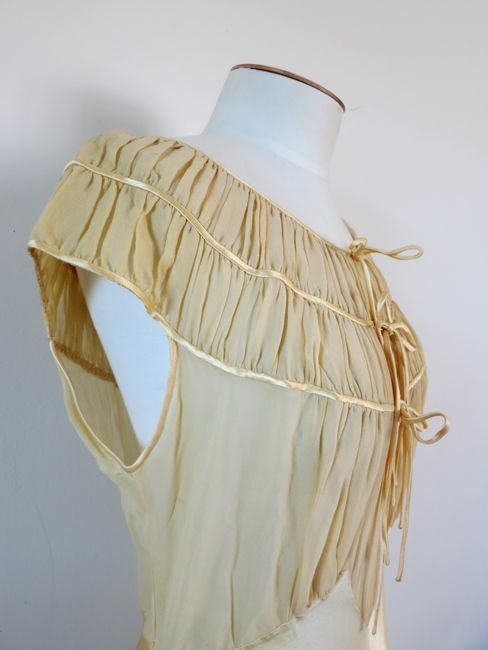 Over a year ago I received an email out of the blue from a blog reader who had a small collection of 20s & 30s clothes that she thought I might like. Would I ever! 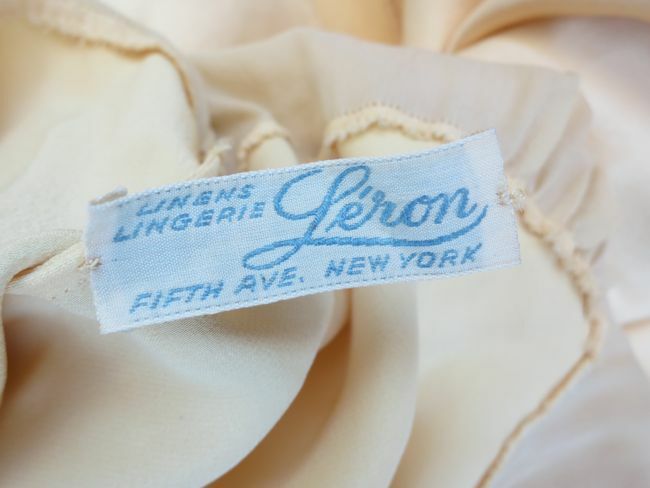 That lovely lady was Karen, and the day her box arrived was like all my birthdays coming at once (only without any additional wrinkles or grey hairs): silks and velvets and beading and lace. The contents were a treasure trove of amazing pieces, in all my favourite colours and techniques. I photographed them right away, and have been meaning to share them with you ever since, but I’ve just been continually too busy this year. I finally got all the photos sorted for one of my favourite items (who am I kidding, they are ALL my favourite items!) and was going to show it to you to coincide with the HSF Yellow challenge, and then internet in Vanuatu was too expensive to upload them. 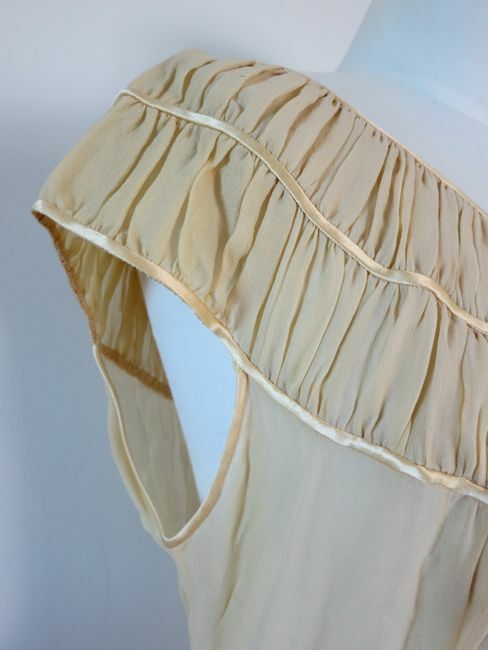 So, a little late, but no less deliciously gorgeous, I present this 1930s/40s silk negligée in butter yellow. 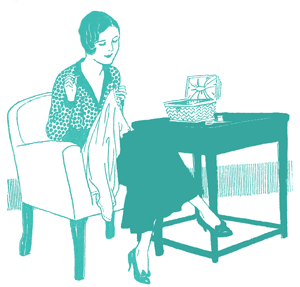 …The sewing is clearly the work of a consummate needlewoman. I suspect that the negligée may very well have belonged to a bride. There is something about the colours and cut that is very youthful and innocent. Other than her honeymoon or in a Disney fairytale where she’s bouncing out of bed to throw open the shutters and sing while birds perch on her outstretched hands, I can’t imagine when a girl would wear this! 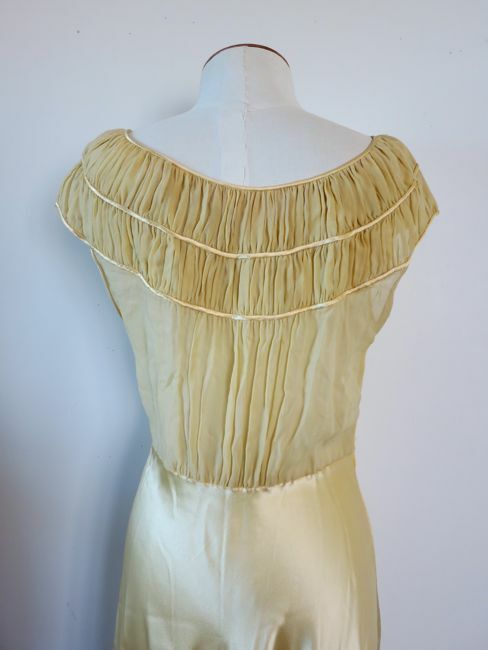 Today you could easily wear this as an evening dress, or even a wedding dress, and with a slip underneath, few people would realise that it was originally little more than a slip itself! Thank you a million times to Karen for giving me this amazing piece to study and share. 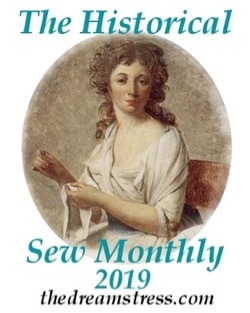 It brings me a little happiness and sunshine every time I think of it: the lovely yellow, and that long ago seamstress, making her living with perfect stitches. 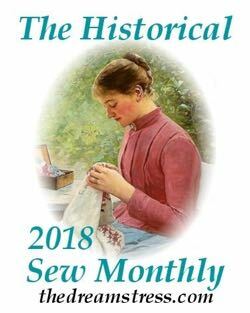 If you want to see a few more pieces of vintage beautifulness in my collection, check out my posts on Elise’s gift, Theresa’s 1915 dress, and Lynne’s quilted petticoat. 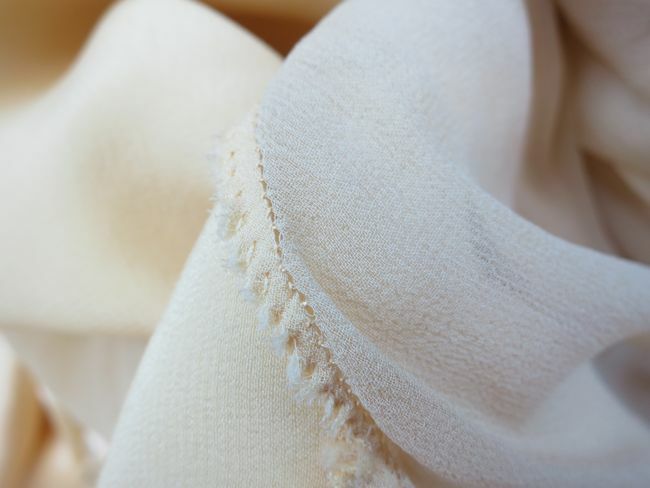 Beautiful hand-sewing and lovely fabric! 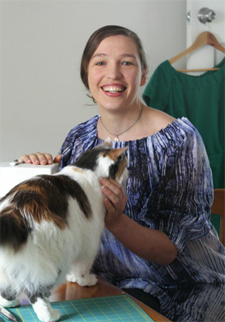 Just to see garments of that quality is exciting, to actually own it (and thus be able to pet it whenever you like) must be awesome. I can’t wait to see the rest of the collection. And I just have to say, I always enjoy your posts, you have a lovely way of writing and giving a vivid sense of place and atmosphere especially in your travel or home related posts. Between the L.M. Montgomery reference (her books are close to my heart) and some very funny observations, I really enjoyed this one. It’s a nightgown. 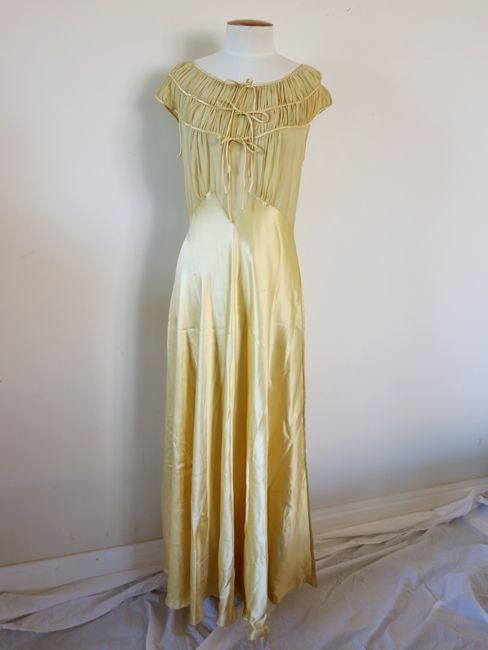 It may very well have once had a matching negligee. And possibly little satin slippers. What an absolutely gorgeous thing! 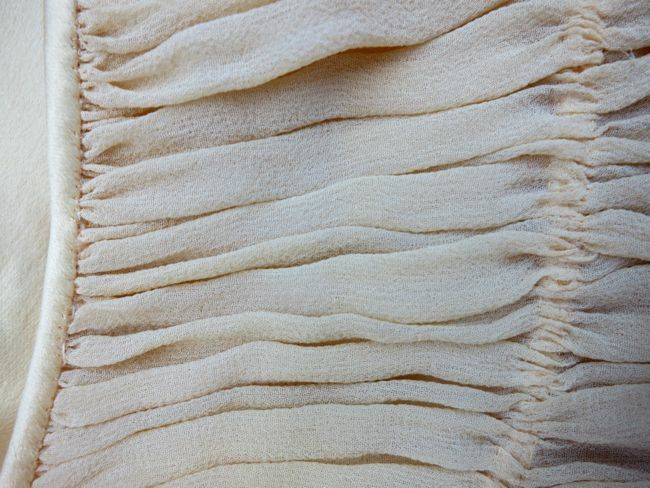 Bless you for all those close-up shots of the stitching – just the bits I would have wanted to see if I had it in my hands. The pin stitching attaching the chiffon to the silk! Swoon. I always wish that museums would include lots more interior shots and close ups! So of course I have to! And I’ll have the ridiculous conversation with Rudolf Hrušínský. Ta-da! The conversation could deteriorate a little. 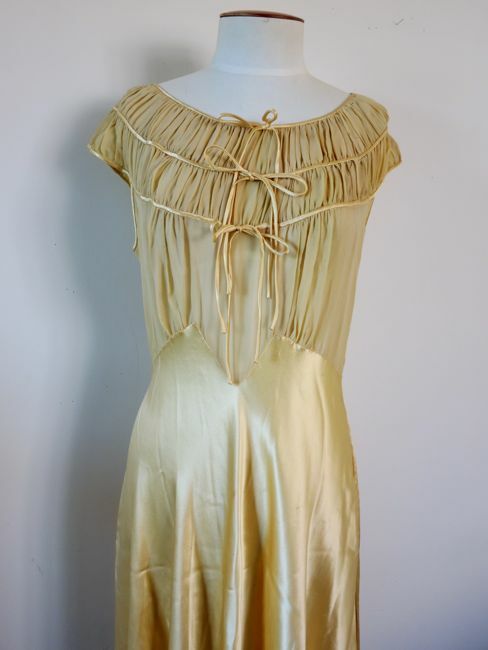 This is technically a trousseau night-gown from the days when honeymoons were honeymoons, so quite possibly it would not have been worn very much… Rather like really nice wrapping paper on a present. Which is why it survives in such excellent condition. Oh, I’m well aware of that! I thought I’d alluded to that, but perhaps a little too delicately! 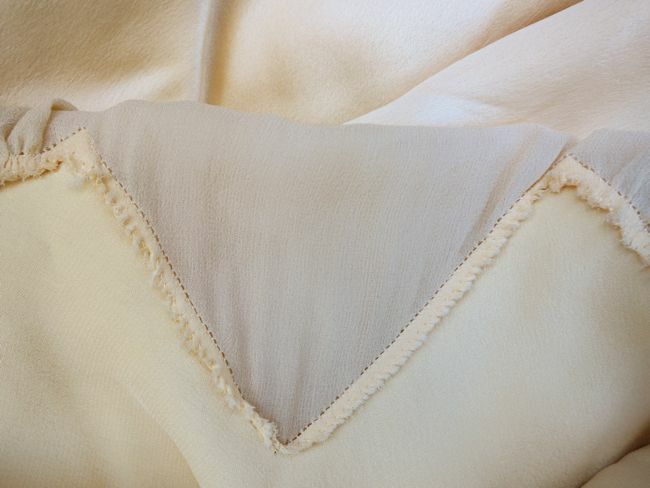 The yoke with those lovely gathers and satin piping – utterly delicious! Isn’t is just gorgeous? Such an inspiration! Indeed – I’d love to use such a detail on a real dress. Oh, wow, once more. All that stitching. That delicious fabric. WOW. I noticed that, too, but it was fun to have a link to the ‘beginning’. It is pretty amazing! So many people have generously helped to build my collection, and brought me (and hopefully, through me, you) so much joy. And the way this gown is made! Swoon…. That’s the whole idea: you are very generous in the way you share with others that it is a pleasure to help you by providing items for sharing! Exquisite. I consider it couture also. 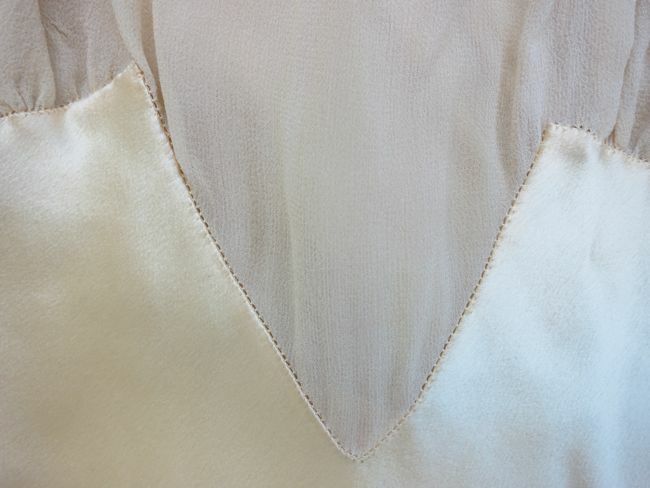 Just this past week, I had the opportunity to purchase some handsewn satin slips and nightgowns. 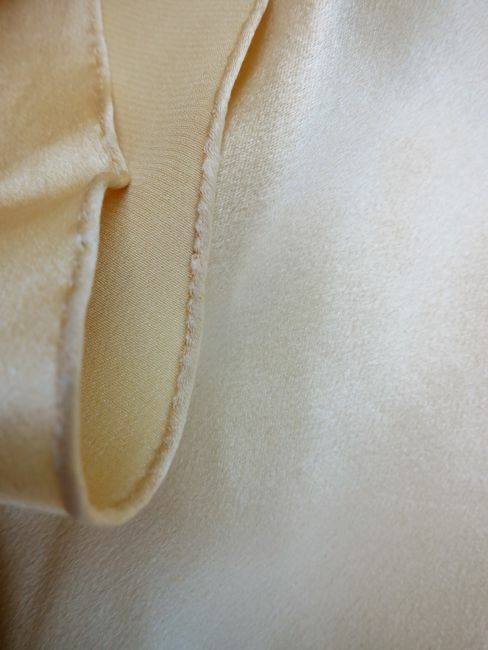 French seams. One also has a label from New York. Your photos are great. Thanks for sharing. Oh, I’m how wonderful to see this! I have loved that nightgown for probably 25 years. I found it in a thrift store in Florida (of all places) for no more than $20. I’m so glad to read your thoughts on it and so happy that it has found the perfect home.